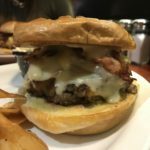 Well before I arrived in Back Bay I had already deemed Boston Burger Company a priority destination during my 48 hour visit over St. Patrick’s Day weekend. 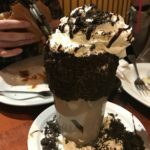 After seeing mouth-watering pictures of the restaurant’s #FreakFrappes I knew there was no way I could pass up the opportunity to try one for myself. With three locations in and around Boston proper we opted for the Boylston Street location. We called ahead but as luck would have it, they don’t take reservations. So naturally when we got there around 8:30 on a Friday night there was an hour wait. My friends and I all looked at each other, collectively thinking “is it worth the wait?” We decided on yes, put our name in and ran across the street for a drink at Dillon’s while we waited. When we got the text our table was ready around 9:15 we finished our drinks and made a beeline for our burgers. 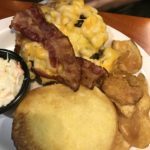 The menu was full of creative burgers, with traditional topping options and more outrageous ones. I’m talking things like mozzarella sticks, pulled pork, even apples and fried bananas. Decision making was not easy. Looking over the menu, it took us quite a while before we were finally ready to order. I opted for the Vermonster which was one of the more simple burger options, a cheddar cheese burger with sautéed apples, red onion, bacon, and maple mayo on a toasted bun. 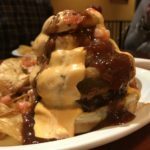 Others in the group opted for burgers that were a bit more extravagant like the Pigferno, a burger loaded up with habanero bbq pulled pork, inferno habanero salsa, beer-battered onion rings, spicy mayo, and american cheese. Other outrageous favorites from the evening also included the Hot Mess (bacon, sweet potato fries, homemade thousand island dressing, diced pickles, jalapeño, red onion, lettuce, american) which was featured on the Rachael Ray Show, and the Mac Attack (homemade 4-cheese mac & cheese, and bacon) which was featured on Diner’s, Drive-Ins, and Dives! 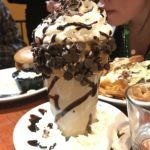 While the burgers were amazing, the real reason Boston Burger Co. is worth the visit is the #FreakFrappes. These picture-perfect milkshakes are just as outrageous as the burgers, and equally as delicious. 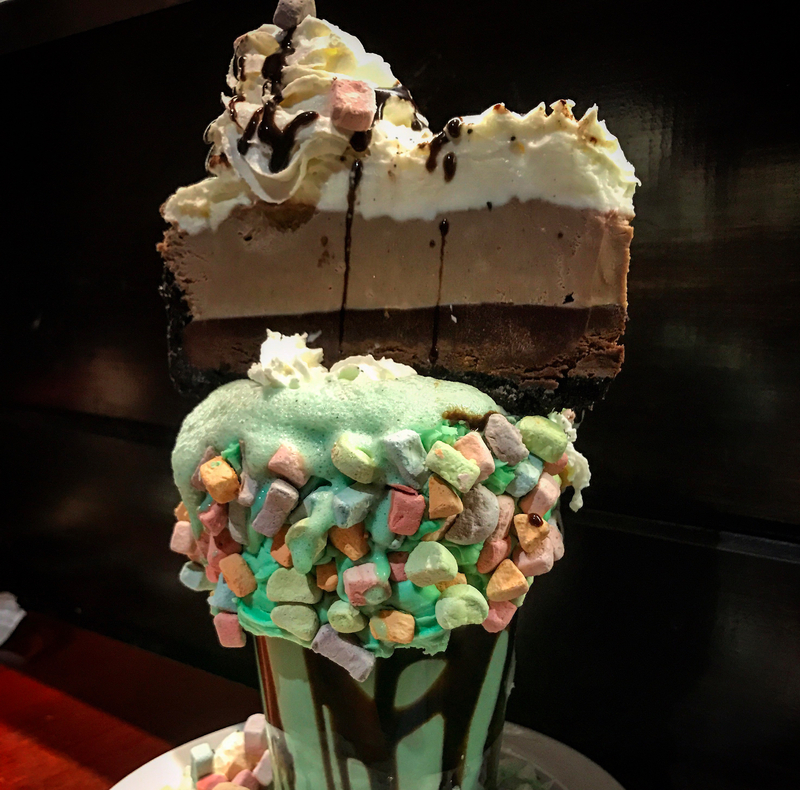 I ordered the March monthly special- a lucky charms covered mint frappe with an entire slice of cake on top. After my burger I could really take a few bites of the cake, so it unfortunately went to waste, but just a few bites were plenty enough as it was extremely rich and chocolatey. While I chose to get the monthly special, I can never say no to mint, choosing it over some of the other options was tough. I mean, who doesn’t like an Oreo milkshake? Certainly not a place for the cost-conscious, #FreakFrappes themselves will run you about $10 each while the burgers range from $10-$15. Since you’ll probably want to get both a burger and a shake, you can expect to spend at least $20 a person. My opinion? Worth it just for the picture alone, but it all tastes pretty good too. The next morning we all felt a little bit of a food hangover. We had stuffed ourselves the night before with burgers and milkshakes, so it was no surprise we didn’t feel so hot. I’m not sure if it was just the burger/frappe combination or the greasy toppings most of the burgers had, but the food hangover quickly passed and all that remained was the craving for another Boston burger. What’s your favorite burger topping? Let me know in the comments.